For my birthday, I was given a bonsai tree from my parents. I have always wanted a bonsai tree because I have never had time to meditate. 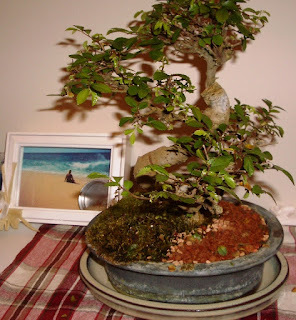 I am a little anxious in owning a bonsai tree because I hear they are easy to kill. I spray mine with a water bottle at least twice a day. I also have a bonsai power shake that I'm supposed to feed it once a week. I hope this is enough and not too much. How do I know if I'm giving it too much water or not enough? Mom says it's a banyan, but I'm not so sure. So I decided to put it next to Grandma and have her take care of it. She'll do a much better job than I could. :) Maybe one day, I'll have time to meditate instead. So, any ideas on how to care for a bonsai tree? And which kind this one is? you need to talk with kenneth. He has had 4 bonsais, and his dad has had several. He is really good with them....aside from the fact that they have all died from being in Utah...bonsais don't do dry air. anyways, it sounds weird that I am recommending you talk to him after all of his have died, but he really knows what he is doing...if anything, he has 3-4 books on it.